We've long referred to Thomas as a human alarm clock. He's a consistent early-waker which, much to my chagrin, doesn't seem to be changing. The last few mornings however, he's been beaten to his job by a very LOUD, very ANNOYING noise. Like, the kind of noise that wakes you from a solid sleep and isn't pleasing. It's a noise that has illicted foul language from the master bedroom. It's also a noise that we couldn't quite place - where it was coming from, or exactly what it even was. We ignored it the first day, assuming it was something at a neighbor's house. This awful racket couldn't really be emanating from our house. Yesterday morning it started again right at dawn so I got up to at least try and figure out which side and level of the house it seemed to be coming from. I reported to Mark that it was either coming from the south, the north or the east and that it seemed to originate either from the basement storage room or the roof. He was as impressed as you are, my four loyal readers, by my sleuthing skills. In my defense, the noise is a little like a jackhammer noise but kind of dampened, yet also kind of echoey. And, it comes in rounds like machine gun fire. Just about the time you think you're narrowing down where it's coming from, it stops. This is not your run-of-the-mill house sound. This morning everyone was still sleeping peacefully, including the human alarm clock, at 6:40 a.m. 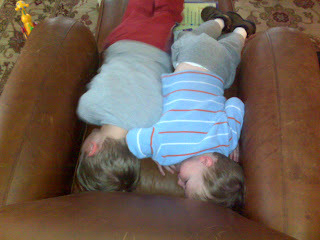 The boys played hard outside at a party for hours yesterday so it seemed like we might be on track to get an extra 20 minutes of shuteye. Then, at 6:41 a.m., it starts. Because Mark and I were out past our normal curfew last night, this assault on our Sunday morning was particularly offensive and Mark was mad. And, the noise has now woken Thomas which is a cardinal sin. We're lying there listening, trying to figure out what it could be. Me: Do you think it could be woodpecker? Mark: Don't woodpeckers peck on wood? Mark: That's definitely not the sound of wood. That's metal. Me: (envisioning our siding being mutliated) How do you know? Me: I can't think of anything else it could be. Mark: It's not a woodpecker. It's something on the roof. With that, he goes outside to investigate. Within two minutes Mark is back inside asking where our basketball is. Me: Why do you need a basketball? Mark: I need to throw it at the roof. Me: Why, what's on the roof? Mark: A fat, %$*#@$%^* woodpecker. Mark: Yes, aside from being a fat, %$*#@$%^* woodpecker, it's also a stupid woodpecker. It's pecking on the metal exhaust fan from the attic. Ah, so that explains the echoing quality of the noise. He heads back outside and suddenly the jackhammer sound stops. It is replaced by the sound of a ball bouncing repeatedly down the roof. BUMP, BUMp,BUmp Bump, bump. Over and $*#@$%^* over. After a few minutes it stops and Mark comes back inside asking if we know anyone with a BB gun. Great. So, as of right now, the metal-pecking woodpecker has been temporarily scared off its perch and Mark is strategizing their next encounter. I'm hoping we don't need a permit for whatever happens tomorrow morning. I'm also, however, hoping to return to our normal morning programming where the first sounds I hear belong to our sweet human alarm clock. Mark updated flickr with new photos of Easter, birthdays and Jayhawk revelry. Check them out in the badge! Tonight was my monthly Bunco night. Bunco night consists of 12 friends, lots of appetizers and lots of socializing. We usually do play Bunco, but it's not really the reason we're there. And, since it's a game of no skill and total luck, it's very conducive to much talking. You can definitely leave your concentration at home. When I arrived home I found Mark and Andrew in the basement deep in concentration. They were playing chess. It turns out that while I was drinking a lovely pinot noir and catching up on the latest neighborhood gossip, my four-year-old was learning about rooks, knights, pawns and bishops. He officially knows WAY MORE than I do about chess. The worst part is that he also knows how to play Bunco. This morning I asked Andrew to go pick up toys in the living room so the rug could be found by a vacuum cleaner this afternoon. He disappeared for a few minutes and when I went in later to check his work I found that he had done an excellent job. I was mightily impressed that he had done it a)without my reminding him three or 30 times to do it; and b) that he hadn't come back begging for praise when he was finished. This afternoon I got right on eye level with him and gave him what we probably all want from others for a job well done. I gave him a million dollars and a four-week vacation. No, wait, did I write that out loud? Really what I did was got on his eye level, gave him a hug and thanked him in very clear terms for helping me. I told him I appreciated his hard work, that I had noticed and that I was proud of him and thought he should be proud of himself. I might have poured it on a little thick when I added that I thought it would be great if he would choose to be such a great helper everyday. He looked me square in the eye and said, "Mommy, I could be a good helper like that everyday but I can't." I was, as you might guess, a little confused and I asked for clarification. He said, "Mommy. I like to help you but if I did it everyday, it wouldn't be so good." Still confused, I assured him that helping me everday would be great and he said, "No, mommy. Everyone likes happy 'churprises' and this was my 'churprise' for you. It's not a 'churprise' if I do it everyday so you'll just have to keep waiting for my next 'churprise' for you." If you need me I'll just be sitting around waiting for my next surprise and wondering who it is exactly who's in charge here. What are you doing Monday evening? It's a really neat night to be a Jayhawk and a fun night to live in Lawrence, but I suppose that goes without saying! I'm listening to Brandon Rush, Cole Aldrich and Darnell Jackson being interviewed by news outlets like the New York Times at their post-game news conference and watching Downtown Lawrence become a five-block long street party. And here in the 'burbs we're being serenaded by horns honking and fireworks booming. Maybe the Jayhawks knew that the Henderson boys had their backs. 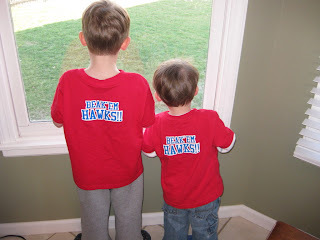 They sported their new Beak 'em Hawks shirts proudly. I'm told there's another game to play, but for tonight, this sure feels like a pretty big win. We in this house are very proud to bleed crimson and blue so we can rightfully say: ROCK CHALK JAYHAWK, GO KU! p.s. I'm starting a Billy Packer club. I wouldn't really call it a fan club so much, if you get my drift... Membership is free and the only requirements to join are that you share my lack o' love for the man's commentating and that you're willing to join me in lobbying CBS for his immediate dismissal. I had a post all ready to go about how I caught Mark and Andrew defacing a photo of Mt. Rushmore in PhotoShop last night. They were drawing mustaches and bowties on presidents and had even added Madeline into the pic. Andrew pronounced it "adorable" when Mark added a puppy for Madeline. Unfortunately, Mark thought he had saved the doctored image but it's now MIA. So, for your viewing pleasure I could offer up images of my harrowing dentist visit yesterday. This would be the one where I had two cavities filled and it took 6 shots of two different ammunitions to numb me. But, boy howdy. Once I was numb, I was numb. In fact, I was so numb that while biting on the blue paper they use to know where to polish, I bit my tongue. I bit it so hard that the dentist and his assistant gasped and went rushing for gauze. Only I could do this. A whole lot of blood and a lovely puncture wound later, I was sent home with an antibiotic mouthwash. And, as a bonus, they took some gory pictures just as it happened. I asked them to e-mail them to me so I could illicit some sympathy from Mark. I'm still waiting on that. Andrew is rooting for Kristie Lee Cook to take it all on American Idol. Any support you could throw her way would be appreciated, as he and Mark are now voting compulsively after each show. Our cell plan doesn't include texting so this is costing us. Thomas had his two-year well visit this morning. He's our 50th percentile kid and we just love him there. The nurse did kindly point out that he might have a chronic runny nose because he goes to daycare. Thanks. Andrew has completed Level 1 swimming. I'm not entirely sure what this means because there's still a lot of sputtering and flailing, but he's very proud of his efforts and so are we. Last, for those of you updating your calendars, Andrew informed me today that his birthday is getting close now, since we're "already on April 2-th."